Branden was out of town for work this weekend, which left me to my own devices. An empty calendar meant that I was free to play with fiber for two whole days. It’s not unusual for me to have a lot of fiber time on the weekends, but this time I went even further. The house was not cleaned, I survived on scrambled eggs and whatever leftovers I could find in the fridge, and pretty much nothing got done except fibery things. That is very unusual. It’s probably been a year since my last do-nothing-but-what-I-feel-like-at-the-moment weekend. We’ll take some decent pictures this weekend, and I’ll tell you all about them then. But for now, look at the pretty blue-greens! Those are the browns and greens for the fall colors sweater. I hope. They hadn’t dried yet when I took the photo, but I think the colors came out all right to match the red/orange colorway. Ironically, I realized while calculating how much fiber to dye that I am probably going to have a lot of extra yarn for this sweater if I use the current design. I dyed a few ounces more than I expect to need in each color (better to be safe than sorry), and with a colorwork body I will probably have extra of the red/orange, too. I think I’m ok with extra yarn, though. I’ll probably hold aside 4 oz of the brown and green, and post them to the shop if I end up not needing them for the sweater. That puts me at risk for another sweater of going back and spinning more, but I think I’ll make it without using up the buffer. I guess we’ll see how the yardage is adding up when I spin it. I am very pleased with how evenly the colors are distributed on the fiber, so I should get fairly even “dyelots” between skeins when it’s spun up. Since I didn’t want a huge addition to the slightly pre-felted Finn collection, I left the dyepots overnight (I didn’t even open the lid to peek!) and snuck in a few minutes at lunchtime today to rinse the fiber. 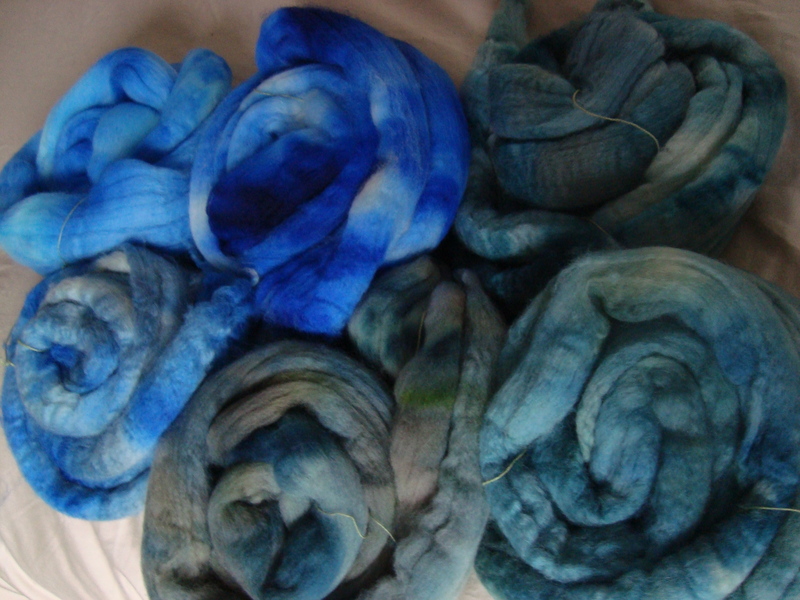 I finished dyeing at 3:00 yesterday afternoon, and I thought I could still feel a tiny bit of heat in the very center of the bundles today at noon. Wet wool is a good insulator indeed. 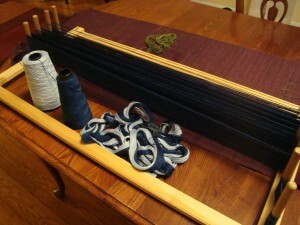 I’m itching to get started on the spinning, just as soon as the fiber finishes drying. Our basement dehumidifier does a pretty good job, so it should be done by tomorrow. I am very excited about that, but it’s enough to be a whole ‘nother post, so we’ll get to that later. The second sleeve of the Falkland sweater is halfway complete, and I finished charting it out so that I can use this sleeve to test the increase section. It’s like real documentation…scary thought indeed. And then, last night I began winding a warp for the next project to go on the loom. About halfway through, I realized that I’m going to run out of yarn. This really surprised me; all of my previous experience suggests that cones are magically endless sources of yarn. But not this time. Looks like I’ll need to order more before I can get any further on that project. The fiber colors are wonderful – both the sale and your own. I prefer the blues and greens for myself. 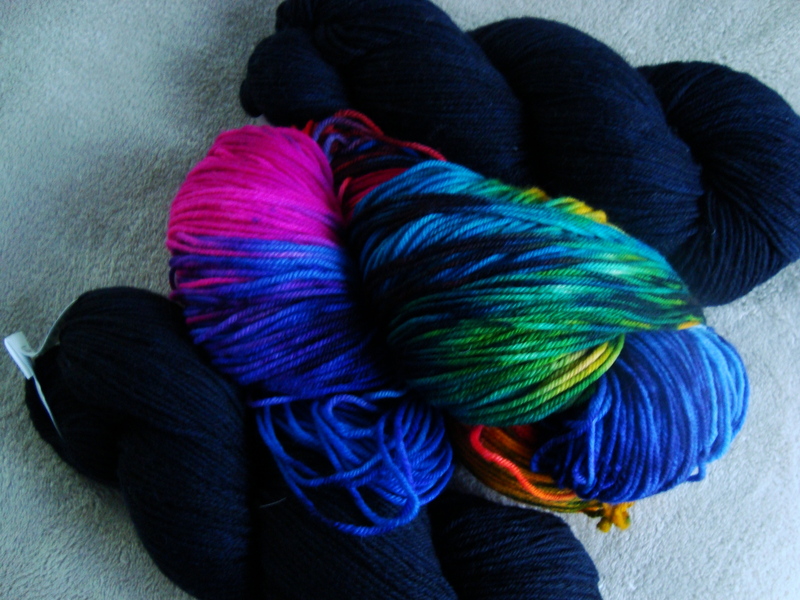 Some day maybe I will dye, spin and knit my own sweater ….. I am waiting to hear about that other sweater that is a whole post of it’s own. Very interesting. Ha ha! It’s funny how some of us define “doing nothing”. Cleaning, schmleaning. This is a FAR better use of time 🙂 Those blues and greens are just stunning, and your fall colors do look (without having the pictures next to each other) like they’ll go along with your multi-colored yarn beautifully. 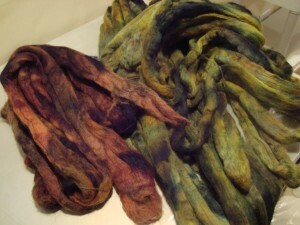 I am also interested to hear about the “felting” that sometimes happens with the yarns – especially the way that some of them (coughFinncough) act so differently than others. Those colors all look so lovely! I’d say it was a well-spent weekend. Wow!! You are one productive gal!!! I love fiber weekends all alone. No one else’s schedule to fret about, except of course that Finn’s cooling schedule. The fall colors looks just perfect for you (and the blue greens look just perfect for me!). DesigKnit is powered by	WordPress 4.8.9 . Page generated in 0.312 seconds using 36 queries.